Man the lifeboats! Here comes the second wave of this deliciously deep, powerfully peaty and wonderfully wild whisky. Corryvreckan takes its name from the famous whirlpool that lies to the north of Islay, where only the bravest souls dare to venture. Swirling aromas and torrents of deep, peaty, peppery taste lurk beneath the surface of this beautifully balanced dram. Its briny character of crisp seaweed, sweet vanilla and rich, dark melted fruits draws you into a long deep finish. Like the whirlpool itself, Corryvreckan is not for the faint-hearted! 70cl, 57.1%ABV. Time to try this baby, I’m almost two months late… Please note that I absolutely adored the committee release of the Corryvreckan (WF92). Colour: white wine (paler than the committee). Nose: it is not the same whisky as the earlier version, but rather beautiful it is. Big smoke and tar, then whiffs of wet wool and fresh walnuts, hints of struck matches and wee notes of cow stable as well as dried seaweed. Not the most complex Ardbeg ever but it’s beautifully austere and the smoke is big. With water: the kind of development that I enjoy a lot in fairly young Ardbegs, both mineral and even metallic and organic. Wet clay, oysters and the same kind of notes of green olives as in the committee release. Mouth (neat): oily mouth feel, the whole starting on a combination of lemon and peaty smokiness, closer to the committee release at this point. Grassy herbal tea. With water: oh this is funny, there are notes that we usually only get in older Ardbegs, such as some camphor and old style cough syrup. Gets sweeter after that, with notes of ripe apples and barley sugar. Finish: long, very ‘Ardbeg’, rather sweet and a little less smoky at this stage. 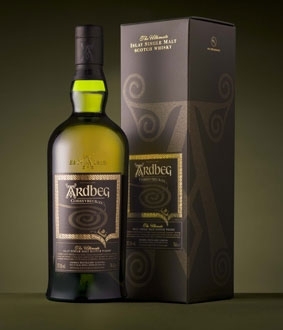 Comments: a slightly milder and rounder version of Corryvreckan, but it’s still high-class Ardbeg. SGP:358 - 90 points.